My shape: slightly wide, slightly tall roots with splayed shape, evenly full top and bottom, slightly center-full. close-set at the top. I need a fair amount of projection at the wire. 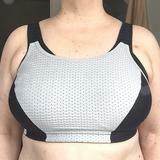 My best fitting sizes are 34G/36FF in Panache. I sister-sized up because I am thick in the middle and didn't want the top to hug me too tightly there. I can wear this on the middle hook without it riding up but it feels more secure on the tightest. I won't be wearing this top a lot so the band stretching out is not a big concern for me. The cups fit great and the straps Stay.On.My.Shoulders. That hardly ever happens. The body of the top fits nicely too. The outer fabric is stretched over the bra and stands away from the gore. I think I will stitch this down. At the regular retail of 85 USD for this top one shouldn't have to do that but I got a good deal so I'm willing to try. The bra is made of a double layer of tulle fabric. It's attached to the outer fabric along the top at the sides but not in the front or the very back. The bottom of the band is not attached. The wires tend to flip up and I've even had the gore twist when putting this on, so getting into can be a little bit of a challenge. Taking it off has not been a problem but I'll have to test it when wet. 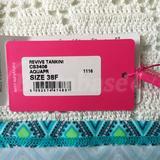 The fabric overlay is your typical soft and stretchy swimsuit fabric, not particularly thick but not flimsy either. The front is not lined. It has princess seams so it's fitted to the waist and has sufficient room at the hip. It rides up a little but my hips are a size larger than my bust so ymmv. The bra construction is supposedly based on the Daily Dream. That being the case, I'm not sure why cups aren't padded, at least lightly. I'll be giving this the shower test to see if headlights show through. I suspect they will. I have some thin pads from something or other that hopefully will work without showing. Again, you shouldn't have to worry about headlights in an $85 top! All in all I'm happy with this. 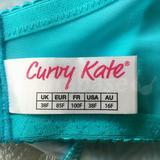 Given that I've had little success with Curvy Kate bras I'm surprised and pleased that the bra fit so well. I've never had a bra-sized swim top before. It's so much more comfortable than my wireless padded cup tops. Nothing is perfect for everyone, but this comes very close for me and with a few tweaks can be nearly perfect. dbmamaz thanks! I think it would look great on you. I don't see your size on Amazon but hopefully you can find it. Beautiful color on you!! Yay for a workable fit!! I may try to find an inexpensive option, too. Recently, I noticed I ripped the bra seams on my 4DD tankini. And, it's not available in a larger size. Thanks Love4Pollinators ! I hope you can find a deal on a top in your size. Need to wear on middle or tightest hooks, but it fits well.